A week ago we published our review of the first sub-$1000 Thunderbolt drive enclosure: LaCie's Little Big Disk. Armed with a pair of 2.5" hard drives, the Little Big Disk ended up being the fastest, relatively affordable external storage available for Thunderbolt equipped Macs. For sequential transfers we were able to hit around 200MB/s, which is better than Mac owners can do over GigE, FireWire 800 or USB 2.0. Still, the Little Big Disk had one fundamental flaw: the use of mechanical storage. I've been an ardent supporter of SSDs for a couple of years now. While I'm more lenient towards the use of mechanical storage for external arrays, anything above moving large media files around can definitely benefit from the use of SSDs. Neither Promise nor LaCie offered an SSD option with their initial Thunderbolt products. That changes today, err technically by the end of November. The Little Big Disk family is growing to include a 240GB SSD version priced at $899. The drive will be available for purchase on Apple's website by the end of the month. LaCie sent us a 240GB drive to run through our tests, and that's exactly what we did. From the outside, the 240GB Little Big Disk is indiscernible from the 1TB and 2TB HDD version we reviewed earlier. It comes with the same doubles-as-a-heatsink aluminum chassis, optional stand, and the same external power adapter (along with UK, EU, AU and US plugs). Once again, there's no Thunderbolt cable included in the box. The chassis is small enough to be portable (much more so than the Promise Pegasus), but it's not the type of thing you'll want to carry around with your MacBook Air on short trips. Inside the Little Big Disk are two 2.5" drive bays connected to a simple SATA PCIe controller, which then connects to a Thunderbolt controller. There's no native RAID support to the Little Big Disk, LaCie instead relies on OS X's Disk Utility to manage the drive's RAID-0 configuration. For the SSD version, LaCie settled on Intel's SSD 320 - a 3Gbps drive we reviewed earlier this year. The 320's performance is nothing earth shattering for a high-end SSD, but the drive is reliable and much faster than the mechanical drives in the rest of the LBD lineup. Since the 320 isn't an Apple SSD, TRIM isn't natively supported. The 320 does a decent job of cleaning up after itself just by writing to the drive sequentially, so I don't see this being a huge long-term problem. How well does the SSD equipped Little Big Disk perform? Pretty much as expected. Sequential read speed is around 445MB/s, while sequential writes come in at 257MB/s. Read speed is pretty close to the Pegasus, but sequential write speed is noticeably lower (again, not surprising given how the 320 performs on its own - a pair of 510s behind a suitable SATA controller might've delivered a different story). Random performance is obviously much higher than anything even the fastest Pegasus can deliver. If you're planning on running applications or doing a lot of small file work on your external storage, the SSDs are worth their weight in gold thanks to great random read/write performance. For media storage however (photos, videos, music), you won't notice a huge benefit. LaCie does correctly point out that you could daisy chain multiple drives if you wanted even greater overall performance. We only had a single drive here so we weren't able to test the upper bound on overall performance, not to mention how RAIDing across multiple Thunderbolt drives would work. Power consumption is a bit better than the HDD version. At idle the drive only draws 7.5W and under load the SSD Little Big Disk pulls 10.7W (just over the 10W maximum for a port-powered solution). The SSD LBD was unfortunately only marginally quieter than the hard drive version, one of my gripes with the chassis we reviewed earlier as well. A fully loaded MacBook Pro is going to drown out the noise, but if your notebook is quietly humming along you'll notice the Little Big Disk. Thunderbolt compatibility seemed fine with the Little Big Disk. I tested it alongside an Apple Thunderbolt Display and a Promise Pegasus. There are still some rough edges with Thunderbolt, even after the latest updates from Apple. There are of course the issues with USB audio corruption when doing lots of writes to a Pegasus array connected to a Thunderbolt Display. I also had one situation where I was copying files (once again to a Pegasus array) from an SSD and had some keystrokes on my USB keyboard just drop out (this one was new). For the most part the issues appear limited to interactions with the Pegasus, but don't be too surprised if there's a little bit of early adopter charm if you've got a particularly complex Thunderbolt setup with drives from both vendors. 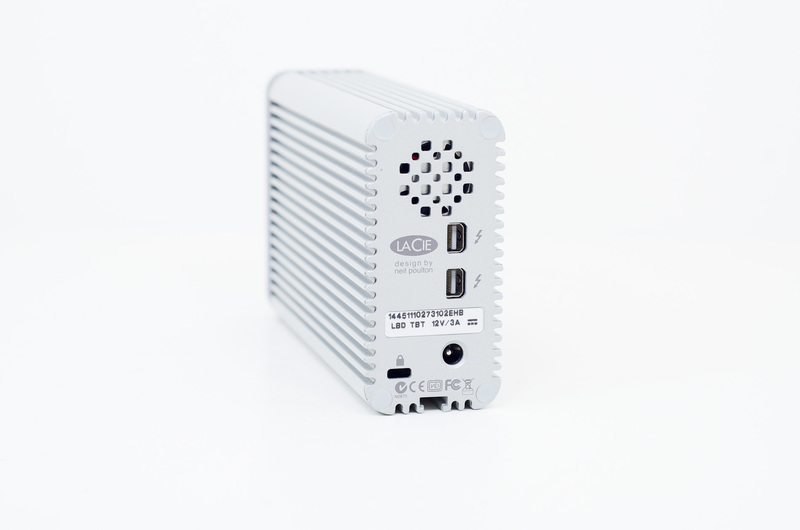 If you're just using the LaCie however, your experience should be pretty predictable. I'm going to sound like a broken record here, but I really want lower priced Thunderbolt options. The Little Big Disk works if you're cross shopping between LaCie and Promise. In fact, viewed through those glasses, the SSD version delivers competitive bang for your buck as long as you don't need more than 240GB of capacity. Taking a step back however, the $899 pricetag is tough to deal with - particularly if you take into account capacity. At that price I'd at least like to see something closer to 512GB, perhaps with a 1TB option to encroach on Promise's territory. If you've got a MacBook Pro, you actually might have a better time replacing your optical drive with a 240GB internal SSD - although admittedly, MacBook Air users wouldn't have such an option and could use the LaCie drive. Technically it'd also be cheaper to buy the 1TB HDD version and swap in a pair of Intel SSD 320s on your own. LaCie gets points for introducing a SSD based Thunderbolt drive for sure. If money is no object and you need a couple hundred GBs of very fast external storage, the SSD Little Big Disk gets the job done. 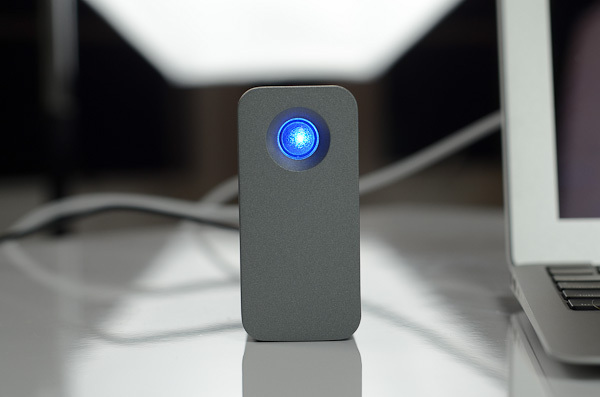 I'd still like to see a BYOD version, although it's unlikely we'll get that from LaCie. Next year I'm hoping we'll see something along those lines from some of the Taiwanese manufacturers but I haven't even heard of any prototypes at this point. Next from LaCie? 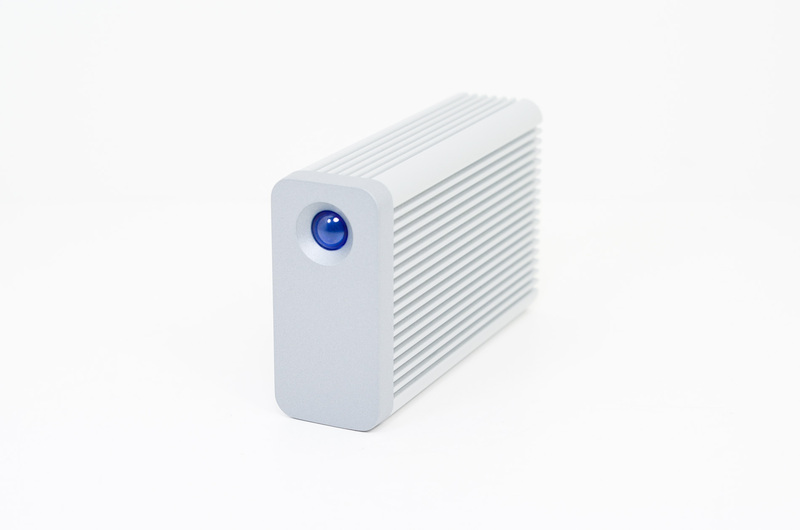 A two drive 3.5" version: the 2big Thunderbolt series. 1) It's not available on any other computer at the moment. 2) Apple computer owners tend to spend more freely, and the manufacturers are taking advantage of this. 1) There is still a dearth of Thunderbolt controller chips for third party OEM's other than Apple to utilize in devices. 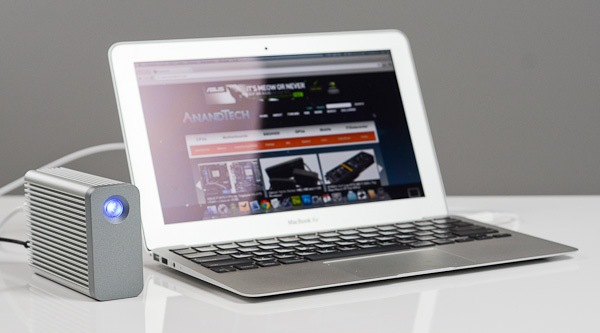 2) This is the first and only compact Thunderbolt drive enclosure on the market. 3) It's made by LaCie, who pay a heck of a lot for designs by the likes of Neil Poulton, Phillipe Starke, Porsche Design, etc. In fact, the non-Thunderbolt 1TB Little Big Disk Quadra lists for $369.99, or only $79.96 less than the Thunderbolt version goes for on the Apple Store. 4) We are accustomed to checking the prices of bare drives at high-turnover etailers such as Newegg, who have thin margins and change pricing almost daily. When a company like LaCie has to set a list price for a new product, they take into account that although they are setting a price that will remain constant for 12 months or so, the market will most likely change considerably during that time. They shoot high, knowing that retailers will discount as soon as demand eases, and also to hedge against the possibility of their component costs increasing unexpectedly. In light of the current situation after the flooding in Thailand, this makes perfect sense. La Cie is not, and has never been, in the DIY market. You'll be waiting a looong time for them to put out an empty enclosure.